For the last decade Kevin Kern has shown that he has a flair for new age music and he is both a talented performer as well as a creative composer. As Kevin speaks of his bond with his piano you would think that he was talking about a person with whom he had spent a lifetime walking and talking with. 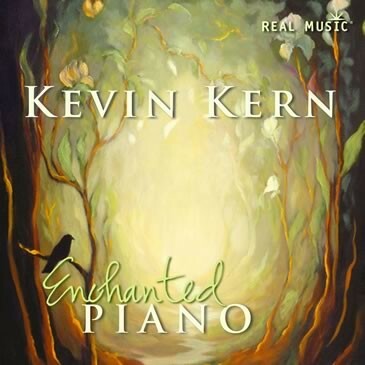 As you listen to him playing his compositions from the Enchanted Piano album on his beloved Steinway B you will find yourself entering into that same friendship along with Kevin. If you open your heart and your mind you may walk away from this album with a better understanding of yourself and of the bond that Kevin feels with this his favorite musical instrument. The album consists of 11 songs and runs about 43 minutes in length. While the overall feeling of the album is very contemplative in nature it does have a little variation in the themes that the music covers. While some compositions evoke a feeling of serenity or tranquility there are other songs that feel more celebratory or bring to mind a happy or joyful event in one's life. It is apparent throughout all of the songs that Kevin has had an enjoyable time crafting this music as an expression of those feelings and emotions that we all have and at times have a hard time expressing. His music invites you to let go of those things that are holding you back and to soar to the heights that your heart and soul can imagine. This disc stands out as a winner and an absolute classic in the choice of the compositions to include and the performances given by Kevin Kern. While the album can be put on in the background while you are doing other things I think that you owe it to yourself to sit down in a comfy chair and listen to this album in its entirety to fully appreciate the music that has been included. Kevin's musical sensibilities are impeccable and this album should win him new fans right along with giving his existing fans a cause for celebration. My favorite tracks on this album were hard to choose as all of them are beautiful in their own right but I found Through the Arbor, Sundial Dreams and Hide and Seek to be the songs that I would return to again and again. This album is definitely recommended by Ambient Visions. From the opening track called Portal Quest with its dark and brooding textures you know that you are leaving the confines of this galaxy to journey through the cosmos via the music on Thierry David's latest release called Stellar Connection. This is his fourth release for Real Music and this album offers us a mixture of ambient, space and some densely atmospheric pieces that are filled with piano and synths that give you the sensation of flight and of soaring through space. By the time that you reach track four which is called Surfing the Blue Orbit the music has morphed into something a little more rhythmic but not overly so. The piano is still the underlying foundation of the music but there are some synthesized versions of Bali bells which gives this song a unique character of its own. A few of the songs have hills and valleys within the compositions in which the song moves from a rhythmic beat to a pause where the beat momentarily disappears and you are left floating in space with an opportunity to briefly take notice of where you are. The beat returns and your journey resumes with new and interesting sounds to act as road signs along the way. The music manages to maintain a shadowy feel to it that completely compliments the idea of moving through the darkness of space in the vastness that is the universe. You never really feel that the darkness is a threatening thing but rather it feels like a dark night where you look up at the stars in wonder. There are many compositions among these 13 tracks that would be perfect if used within a sci fi movie or perhaps a TV show that deals with the strange and mysterious. Stellar Connection runs a little over 62 minutes and during this hour the songs keep you on course for the stars the entire time. Thierry David manages to always aim you towards even darker space with music that is slow-moving and filled with spaciousness without wandering meaninglessly. There are many deep passages in these compositions including the final track called A Silent Voice Answers which leaves the listener in the void without bringing them back home. The music leaves you pondering the infinite reaches of space and fades out while you remain floating until the music is gone. I can see this music as being something that would work well with inducing a serene state of mind or even with doing some mediation but it is a little dark for going to sleep by. Of course I've used Craig Padilla's Vostock to go to sleep by so perhaps you might find this to your liking as you drift off to sleep as well. I am partial to the ambient music that adorns the beginning of this album so some of my favorite tracks are Plenty of Space, A Long Crossing and Surfing the Blue Orbit each of which seems to flow together almost as if they were a longer composition broken down into three tracks. I would classify these three tracks as the heart of this space voyage and which sets the mood for all that is to come. Surfing the Blue Orbit does begin to add the rhythms that will become more prominent through the rest of the album but it still fits in well with the first two songs. My other favorite track on this album is track six which is called Feeling a Stellar Pulse and as the name implies there is a pulse contained within this song. It sounds like a frame drum that punctuates this song with its beat but I think in reality it is called a Wavedrum. It is well done and if I didnt know any better I would swear that someone was playing a frame drum on this track. All in all this is an excellent album that would be good as a background for certain activities like reading, meditating and even sleeping too depending on the mood that you are trying to achieve as you fall asleep. 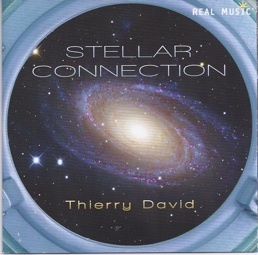 Thierry David does indeed create the soundscape that he set out to when he called this album Stellar Connection. Thierry David has created an immersive environment in his compositions and he takes the listener on a sonic journey with his imaginative compositions that are both mysterious and enlightening. The music on Stellar Connection conveys wonder and awe and is filled with a dense undercurrent that acts as a foundation for the otherworldly journey that the listener has embarked on. This album does not disappoint and is something that I would recommend to the readers of the Ambient Visions website. 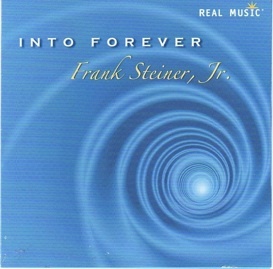 Frank Steiner Jr.'s latest release called Into Forever is just what the doctor ordered when it comes to spending a little over an hour relaxing and letting the stress of the day flow out of you through each of the 7 tracks that comprise this album. On the back cover of the album Frank states that he wanted to create a "musical fragrance to help listeners relax and unwind." After listening to this CD several times I have found the music contained herein to be a contemplative and peaceful selection of songs that gently washes over your consciousness allowing you to drift along with Frank's soothing piano playing which is the foundation of all the music that you will find on this album. There is an ethereal feel to the music throughout all of his compositions that gives you the feeling of floating on waves of light after you have aclimated yourself to the world that Frank has created through his songs. This process doesn't take all that long and before you are even half way through the first track called Love's Whisper with its rich emotional sounds you will find yourself dislodged from the day to day grind and for the next hour you will find yourself wanderinging the tranquil soundscapes that Frank creates with his piano. It is obvious that the music on this album was composed and recorded so as to not break the mood and the flow of the CD. Each song seems to fold into the next maintaining the same serene qualities as the song that came before it. I very much enjoyed this fact because I was not jarred out of the soothing cocoon of stillness that wrapped around me with the first song and continued right on through the last track called Mystery's Invitation. Many times these albums will be used in their entirety as background music for Reiki or Massage sessions, sleeping or for meditative purposes and it is critical that the mood is maintained. Frank has done an excellent job of immersing the listener in an environment of peace for the entire 60 odd minutes that this album plays. The tracks on this album range from the shortest which is 4:58 up to the longest which is 14:59. Most of the tracks are of the 6 minute or longer variety and the only reason that I mention it is that the tracks tend to be perfect for allowing Frank the time to effectively create these peaceful landscapes. Oftentimes on shorter songs you feel like you are just getting started when the song comes to an end. With these longer compositions Frank is allowed the time to develop the song and engage the listener more fully in the experience which in turn deepens the overall effect of serenity that pours over you as you listen. From the gentle synths that ebb and flow behind Frank's piano on songs like Sparks of Love to the bird sounds that ever so gently appear on Lead Me to You or the tinkling wind chimes on Love's Whispher Frank has created a gentle and comfortable realm where the insistent call of the physical world is left behind. You will find that Frank's music wanders the ground between ambient and new age while executing each style effortlessly and with a masterful touch on the keyboards. The sound quality is impeccable and his music has a captivating flow to it that instantly engages the listener. You will find much to love about this album and when you are done listening to it the first time you will probably go back for seconds or thirds as the music allows for multiple listenings without ever becoming tiring. This is an excellent effort by Frank Steiner Jr. and is certainly recommended by Ambient Visions. 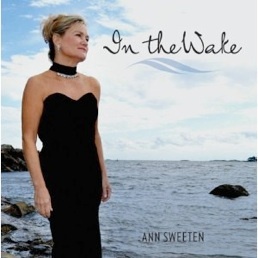 In the Wake, a metaphor for life, is pianist/composer Ann Sweeten�s ninth album (plus two Italian compilations). Co-produced by Will Ackerman (who plays guitar on two tracks) and recorded at Ackerman�s Imaginary Road Studios, the album features several acoustic instrumentalists on strings, flute, oboe, and English horn. Sweeten�s graceful touch and fluid playing style are beautifully expressed on a Steinway baby grand (model B), and the sound quality of the music is flawless. Often tinged with melancholy, Sweeten�s compositions have a dreamy quality that encourages the listener to kick back and just listen for a while, becoming immersed in the music and soothed by the gentle waves of sound. Ann Sweeten draws from vast life experience in the arts with her acting, singing, and dancing in addition to her music. She is also a staunch environmentalist, animal activist, and vegetarian. With so many means of self-expression available to her, it is no wonder that her music communicates so effortlessly. In the Wake begins with �Was It Yesterday?� a nostalgic ballad for piano, guitar, and flute (Trisha Craig). Wistful and dreamy, the gentle flow of the three instruments sets a mood of calm repose and reflection. �Falling Leaves� becomes even more soothing and relaxed, and Akane Setiawan�s English horn adds the perfect counterpoint to Sweeten�s graceful piano. �Metamorphosis� weaves a series of musical themes together to create a lovely tapestry that tells a story of change and inter-relatedness. Sometimes flowing and almost harp-like, sometimes quite rhythmic, and sometimes quiet and still, it is a very effective piece. �Love Remembered� is an introspective daydream with a passionate undercurrent. Andrew Eng on violin and viola enhances the poignance of this piece. As the title suggests, �A Chance for Goodbye� is deeply emotional and sad, and Liz Ehrman�s cello is the perfect accompaniment to the piano. �On Wings of Light� feels lighter and more optimistic, and Setiawan�s English horn keeps the piece soaring to new heights. �Out of Embers,� Ackerman�s second appearance, is a favorite. Exquisitely gentle and dreamy, it seems to tell of hope and renewal - beautiful! My favorite track on this album is the more classical �October Sky,� a passionate and bittersweet piece for piano and viola that would be an amazing tear-jerker in a movie soundtrack. �Now and Again� closes the album much as it began - wistful and peaceful. Cello and oboe make this a gorgeous, heartfelt trio that leaves the listener feeling refreshed and renewed. In the Wake is sure to be another chart-topper for Ann Sweeten! Be sure to check it out at www.annsweeten.com, Amazon, iTunes, and CD Baby. Recommended!